I had reported into the main M.R.E.S. American Zone HQ located in Uetersen, Germany early October 1946. The local headquarters for 15 Section of #3 MREU was to be at Bad Nauheim about 35km north of Frankfurt in the American Zone of Germany. 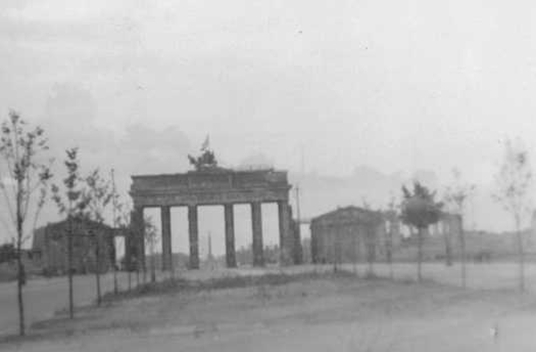 On 27–Oct–1946 my unit left Uetersen and on 29th October after covering the 550km or so we arrived at Bad Nauheim. 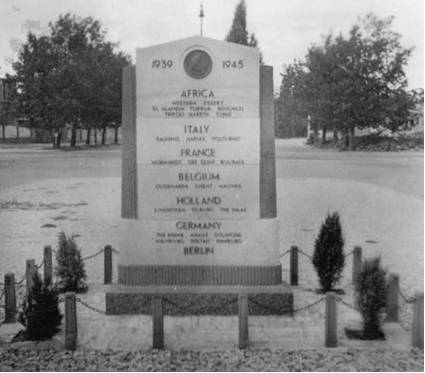 As a personal note, I was particularly pleased with the assignment outcome as Bad Nauheim was just north of Frankfurt where my future–wife–to–be Bea Grontved was situated with the American Occupation Forces working to reunite dislocated families. 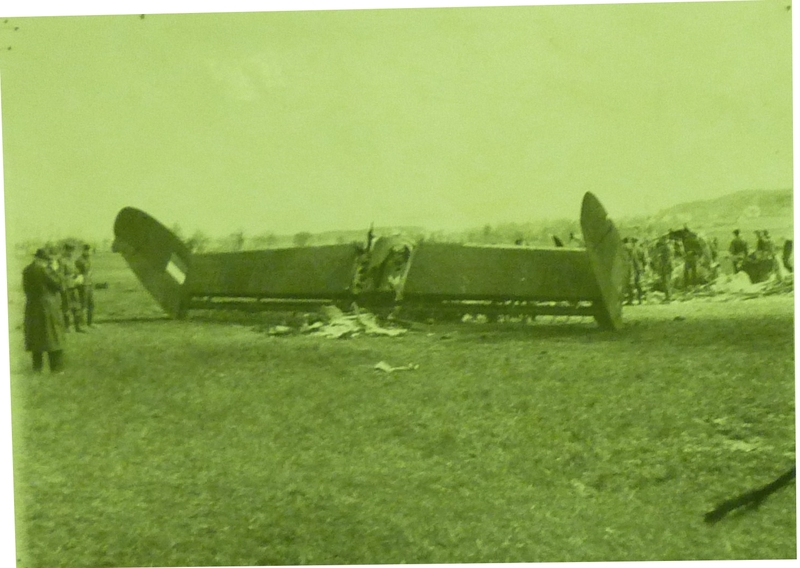 Doc Image : Flt/ Lt Hubert Brooks Processed MRES Casualty Enquiry G1133 and G1173/47 Loss of Halifax NR195. The files are available at the Australian archives under the heading A705. No. 3 M.R. & E.S. After about 2 weeks things were set and our Bad Nauheim unit was in business. The (British) Air Ministry Kingsway generated maps for use by the various MREU search teams. 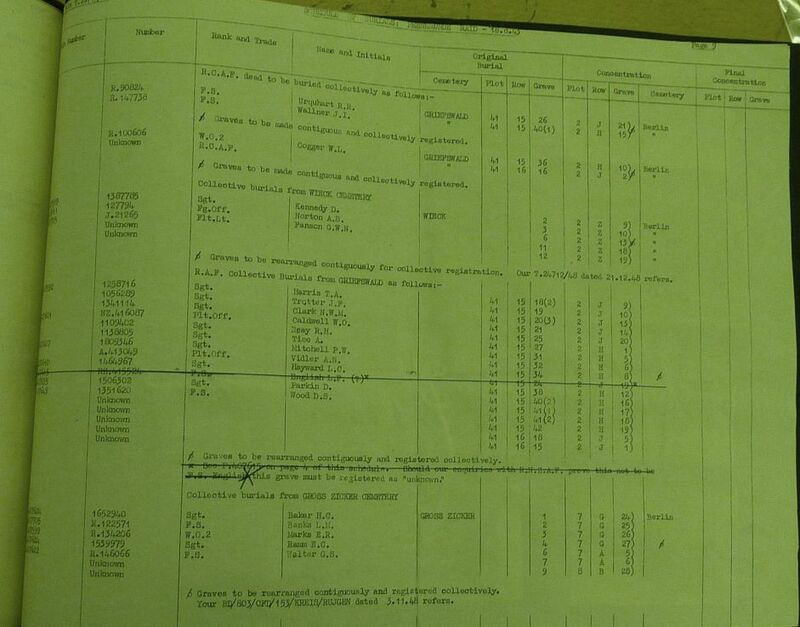 Once we received the maps we marked them up to include known RAF/ RCAF/Allied crash sites. For example while I was with the 15 M.R.E.S. Butzbach (Germany) the information was primarily gathered from captured German documentation. The map of the region near Frankfurt illustrated below is not the original map that I had marked up but was generated sometime after I left the unit to return to Canada. Unfortunately these redone maps sometimes contained a few transcription errors and sometimes were in conflict with the official MREU records. 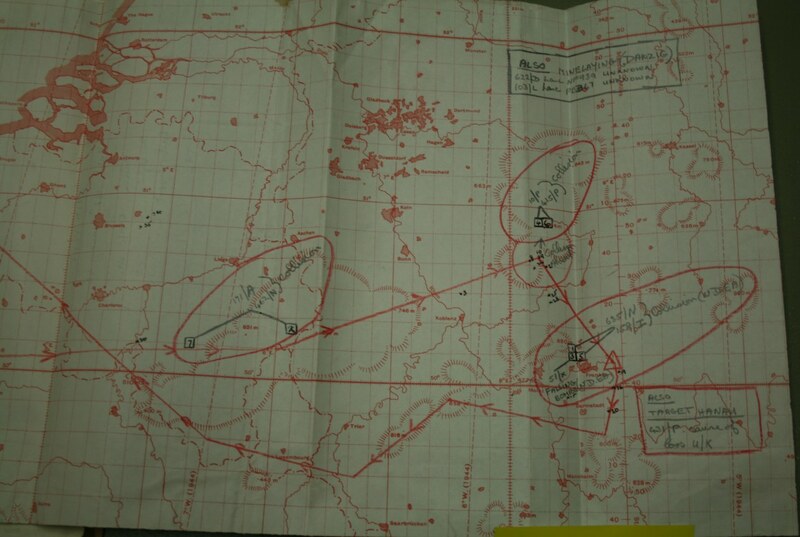 The map below has some markings on it, for example for Halifax NR195 (NP-I 158 squadron) someone has written (center right) “collision ndea” – which means not due to enemy action. (this actually is incorrect), and in the lower right hand corner someone mentions 431P was lost over the target (this was Lancaster KB821). The GRU located and identified 4 of the crew in March 1948, which means this map was written sometime after March 1948 -- after I’d left the unit. Nevertheless this map image gives some idea as to the map tools we were given and our methodology of marking up the maps. I have no idea what happened to my original marked up maps. For the first few weeks all commanders and staff; flagged and indexed casualties, took stock of equipment, had meetings on operating procedures, and held training sessions for new staff. On October 22nd all commanders were given their command assignment – in my case it was Section 15 based out of Bad Nauheim. 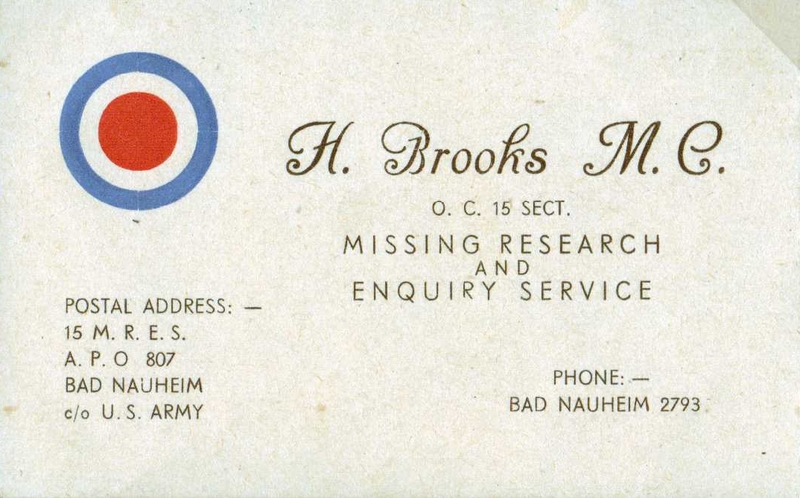 I had been promoted to Operating Commander of the 15 Section of Missing Research and Enquiry Service. 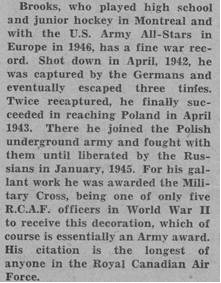 This was a rare honor as most O.C.’s held the rank of Squadron Leader. Working with me in 3 M.R.E.U. 15 Section were, what would turn out to be, two excellent Investigating Officers: F/Lt. W.J. Smith, D.F.C. and F/Lt. Donald Thom. My former boss, S/L Chick Rideal was in charge of Section 17 based out of Munich. We were to stay in close contact during my entire posting in Germany. We all reported in to W/C Brinsden (with S/L R.H. Barber his adjunct) who was based initially in Uetersen, in the north of Germany, located about 34km north–west of Hamburg. Uetersen was a re–equipping staging point for No 3 M.R.E.S. 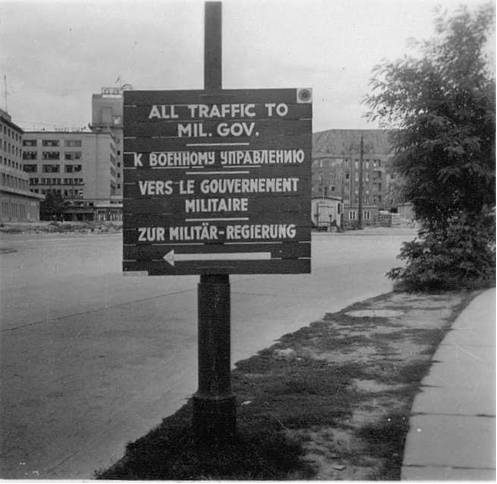 prior to the unit HQ being re–located (24–Nov–1946) to Karlsrehe in the American zone of Germany. Karlsrehe was just 140km south of Frankfurt. W/C Brindsen made sure that Procedures Ref: 6.9 for his #3 Officers i/c were well documented and understood. Below find a few extracts pertinent to my job as officer in command. 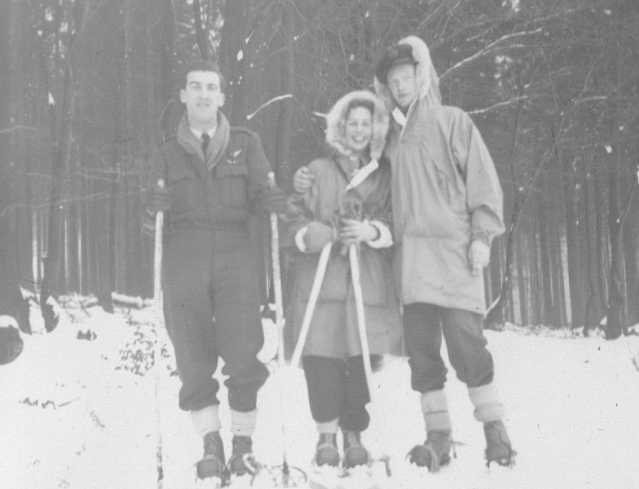 January and February of 1947 was brutally cold with severely icy roads that hampered not just my Section 15 operation, but most of the Sections operating in the American Zone of Germany. Our task, as were the tasks in the other Sections, was further compounded by the persistent unreliability of the transport vehicles that were assigned to us. Constant vehicle breakdowns – typically at great distances from our HQ – was the norm. To get things fixed, more often than not one had to deal with the black market and trade fuel or cigarettes or whatever for essential parts for German Marks were laughed at. Everyone understood it. To maintain ones credibility one had to respond honestly and justly. It most also be understood that Germany after the war was essentially lawless. The Allied Forces were viewed as the army of occupation. 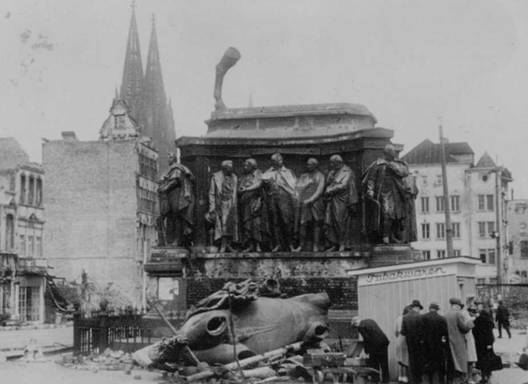 As a result of the Allied bombings during the war, widespread destruction existed in German cities and towns. There was a skeleton German police force – but they did not seem to matter. The American MPs were present and stepped in from time to time but unfortunately the Germans more often viewed them as heavy handed and arrogant. One just had to cope and focus at the job at hand. These were hard times. The years 1946–1948 were harsh ones for the local German population. Known later as "Der Grosse Hunger" (The Great Hunger) between January 1946 and June 1948 some 143,000 Germans (one in three of all registered deaths) died of malnutrition and exhaustion related conditions! 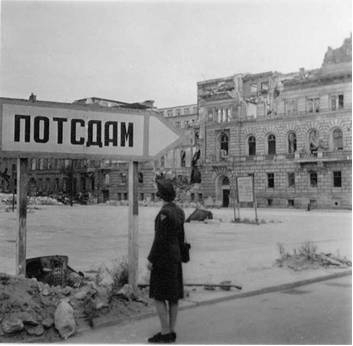 Severe rationing and food shortages were everywhere. I made sure that the locals that helped us in our section were fed a proper lunch. We often had to bring food back from trips to Denmark to provide the essentials. It was very clear right from the outset that watching out for the mental health of the men in my Section was of utmost importance. I had to constantly insure that they had sufficient downtime away from the job and I encouraged them to participate in the ever–growing American recreational activities. Other Sections had human resource issues with search officers suffering from what would latter be termed "post traumatic stress syndrome ". Five or six years of war followed by this job in the heart of bombed out Germany can turn even the most solid of characters. While I was with No. 3 MREU in Scandinavia, often times Padre S/L Parsons from 85 Wing HQ had to visit to talk to the men about their personal problems. This seemed to go with the territory. I was lucky – my section held together fairly well without the drama experienced in other sections. But I had to work at it and watch the men carefully. Perhaps surprisingly, responses started to come in as soon as 3 days later but the bulk of the responses were not received until mid to late February. Some time was spent engaging with the local population to win their trust and co–operation in responding to our questionnaire. Up until this point we had closed out a reasonable number of files – but frankly we had had very little backlog coming into the area. 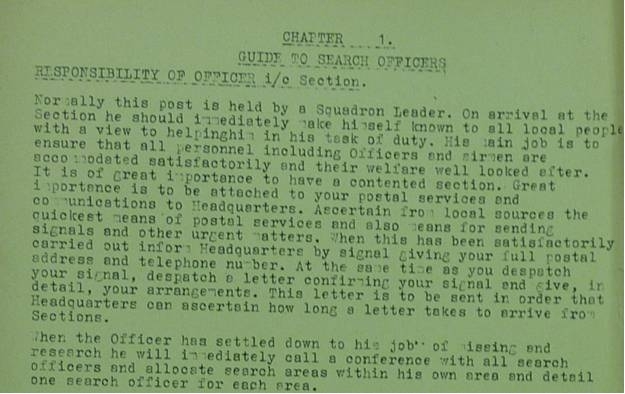 Unlike the Scandinavian assignment, information flow back to London had been somewhat hampered during the war. This "database" of information that we obtained from responses to the questionnaire put us into high gear. We had compiled it into actionable files and were hard at work for most of February and March closing them out one at a time. "No 15 Section still operating in the Frankfurt area with great success" was the cryptic entry into No 3 MRES OPERATING RECORD BOOK Ref: 6.10. Late February 1947 time frame I was in need of a break. 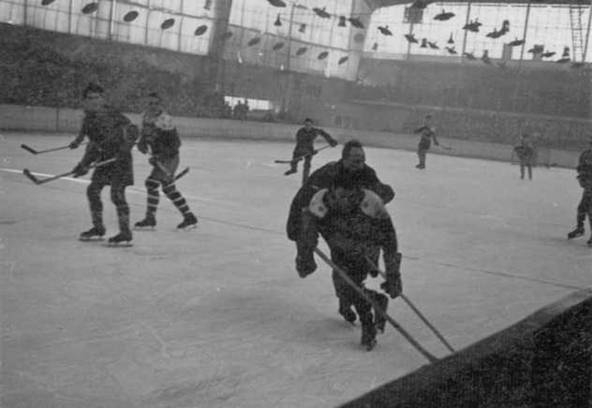 I asked for and received permission for a few days off to go south to Garmish Partenkirchen to play hockey with the US Army European Theatre Operations Team. Permission was granted. 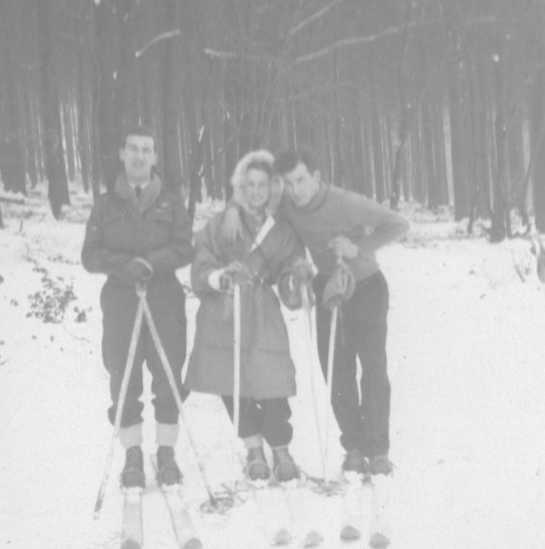 Several of the men were due leave, and they decided to join me and do some skiing. Hockey was just the athletic diversion I needed! The team was actually known as the US Army All Stars. PHOTO: Hubert Brooks with US Army AllStars. 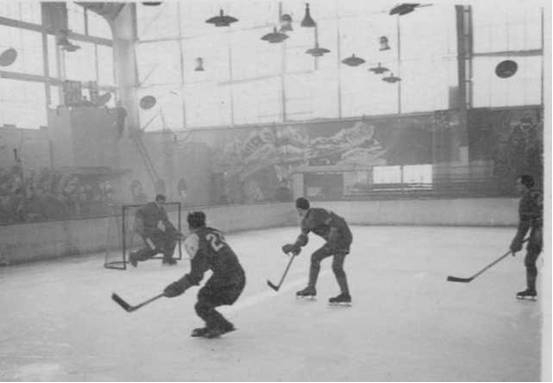 Right Foreground with Left Handed Stick Chasing Puck. 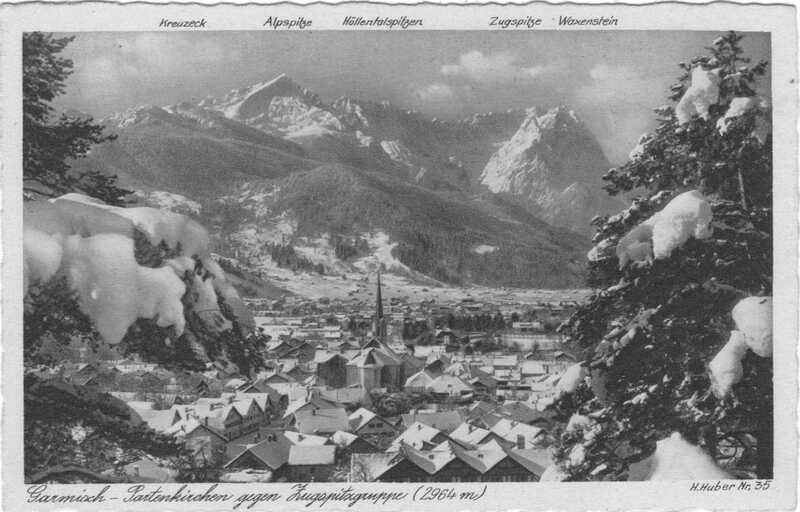 After an extended 5 day weekend in Garmish Partenkirchen we returned to Bad Nauheim. The Frankfurt operation had continued in my absence and good progress had continued to be made. 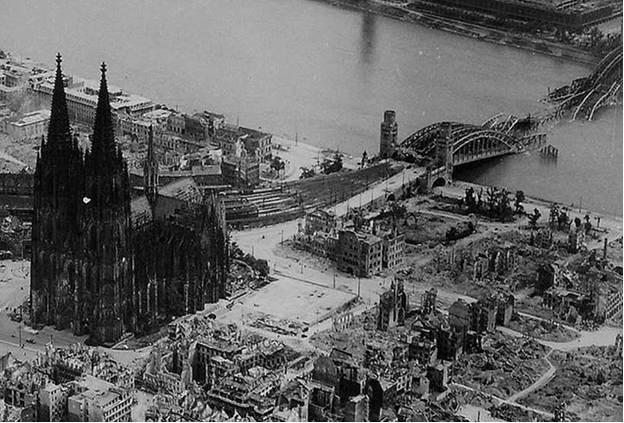 15 Sections’ Frankfurt and surrounding area was one of the largest and required a lot of investigations. 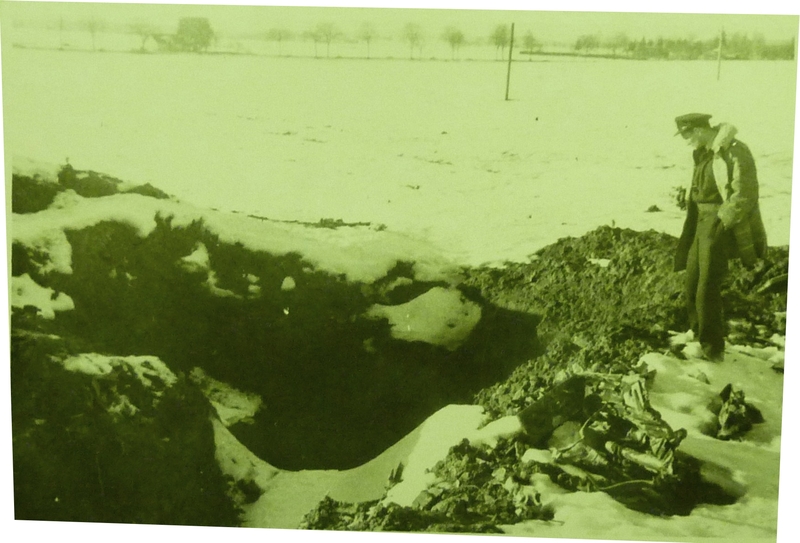 In conjunction with the GRU, early April we started to carry out exhumations and identification of allied aircrews in Frankfurt and surroundings cemeteries. 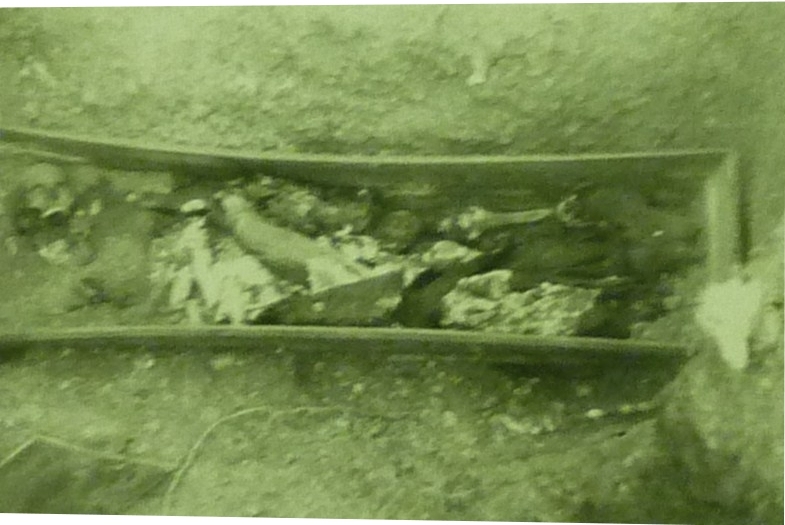 I was stunned to personally make a discovery of several allied bodies in the yard of the American Army HQ in Frankfurt. However there were many excavations and many cases closed. 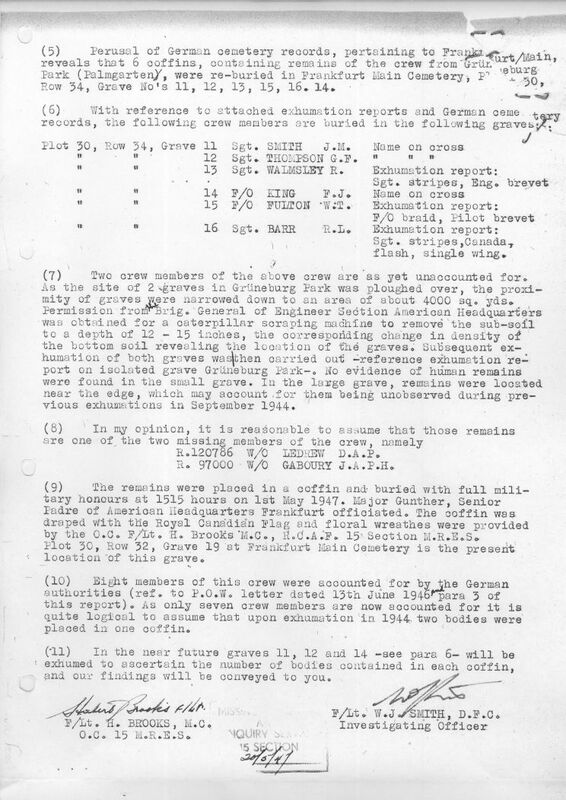 Too often we had to excavate mass graves looked in German cemetries to identify Allied Aircrew. 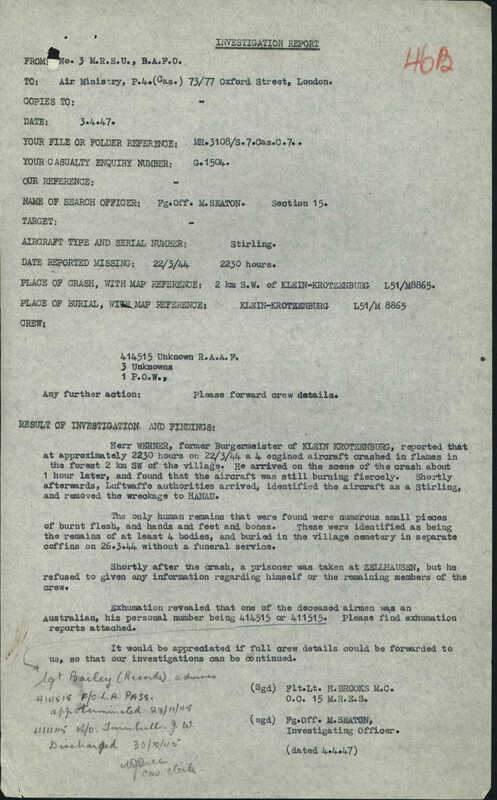 And of course the results of our investigations had to be clearly documented in a Burial List (see example below) which was forwarded to H.Q. 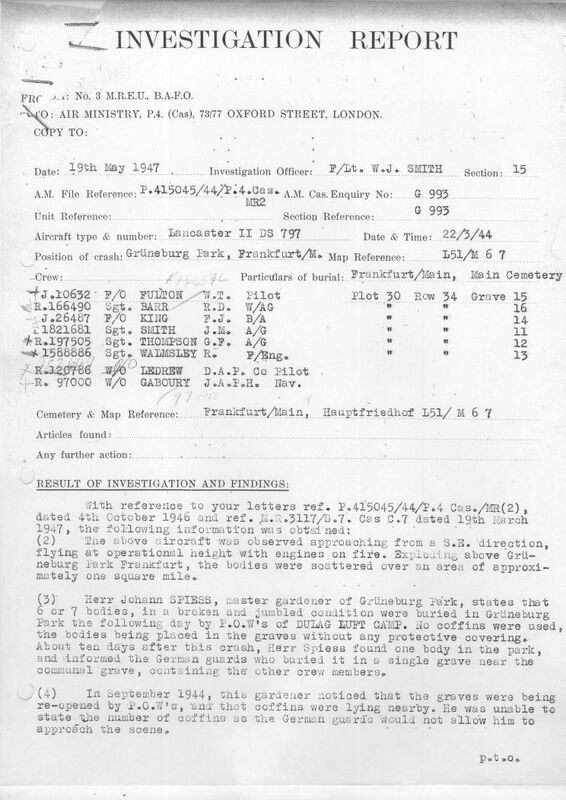 Some example REPORTS on the investigation into Lancaster II DS 797, Lancaster III JB.563 and Lancaster 111 ND518 D generated by Brooks' MREU Unit at this time. Report G.1720 was then deemed to be one and the same as G 1504. 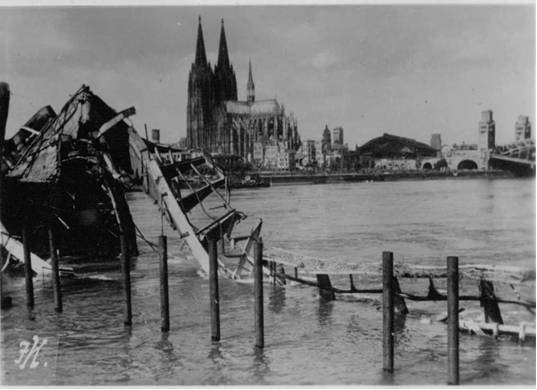 (EDITOR'S NOTE: Robert Lapes Ref: 6.27 is creating a WEB SITE with the objective of re-creating the March 1944 Frankfurt am Main raid that resulted in his uncle Sgt. 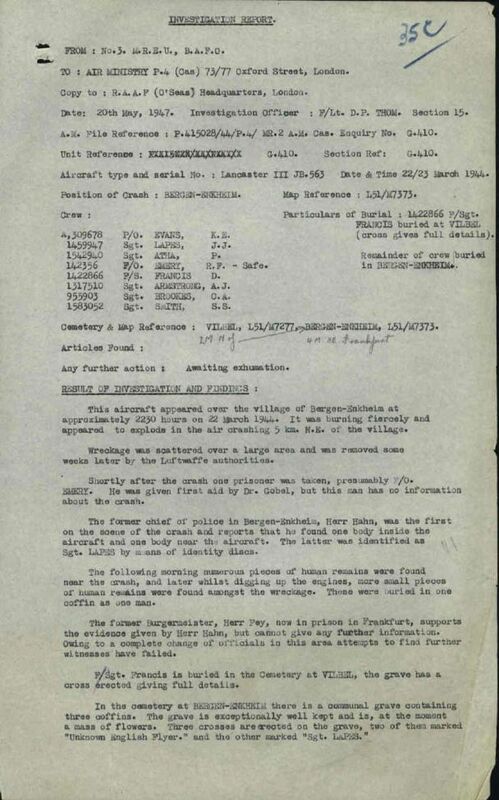 Jackie Lapes' (identified in the above report) Lancaster bomber being shot down as they approached the target. 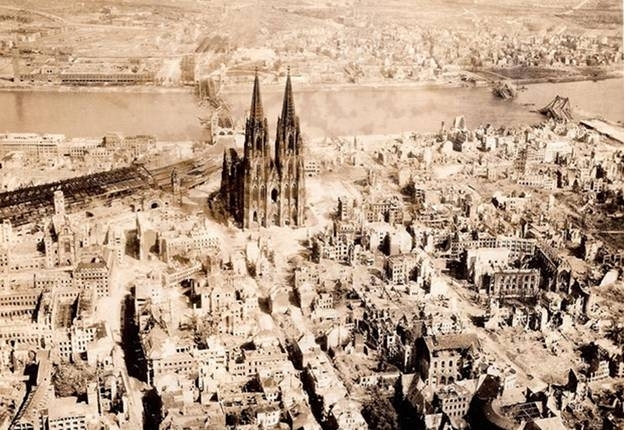 Robert Lapes has also created an excellent map for the March 22, 1944 Frankfurt an Main Raid CLICK LINK that illustrates the various aircraft sorties, including diversionary sorties. One issue that continued to grow and hamper our investigations was that our transport vehicles were continuing to break down with great frequency and the lack of spare parts was crippling our abilities to do our job. Mid March I went to HQ in Karlsruhe to discuss the issue. It turned out my section was not alone and this was a common problem with most of the sections in the American Zone. A request to B.A.F.O. for a new supply of Jeeps and spare parts (some of which came from the British Zone of Germany) along with us getting the wherewithal to service our own vehicles would eventually (early April time frame) minimize the problem. Middle of April we got a new boss in W/C G. Holland taking over command. 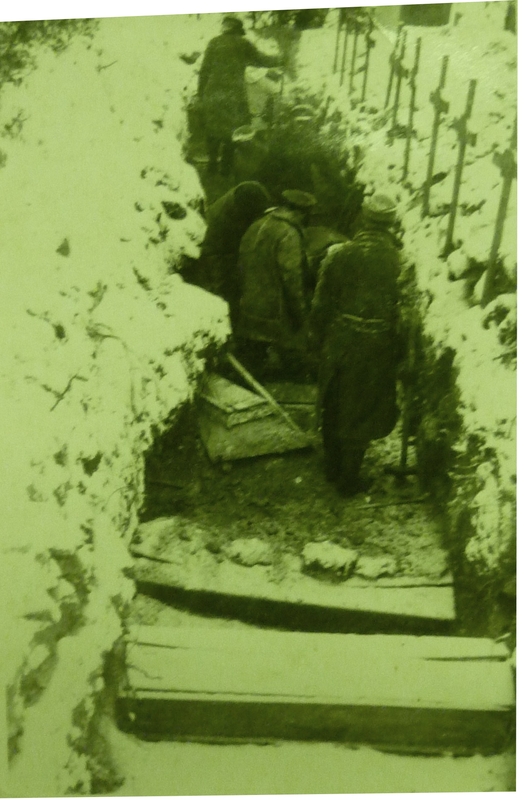 We were making very good progress on the exhumations into May at which time the (Army) GRU unit decided they (in all sections) would only work 3 days a week to provide (mental) relief for their men. This obviously slowed progress. End of May and June and July operations expanded further into Cologne Germany. 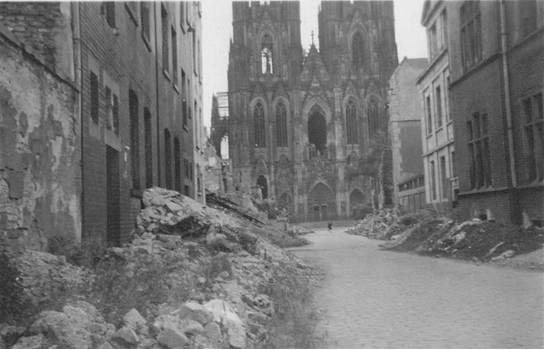 This area had been devastated by Allied bombings. 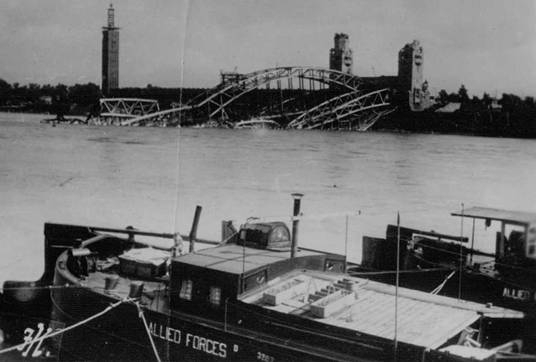 The downed bridges and devestation seen in the background of the above picture above are shown up close in the professional images that follow. We often used the rivers and water ways to get from point A to B as the roads were in bad condition. My group made excellent progress and we closed many open files. In the background the various Dominion governments increasingly clamored to have their officers returned. Initially most had been posted to Europe for a 1 year term. This term had been extended several times. The Canadian government was no exception and had been applying pressure to the M.R.E.S. to speed up the work and expedite the closure of the M.R.E.S.. This was caused by the Canadian Government’s desire to bring home their living airmen. 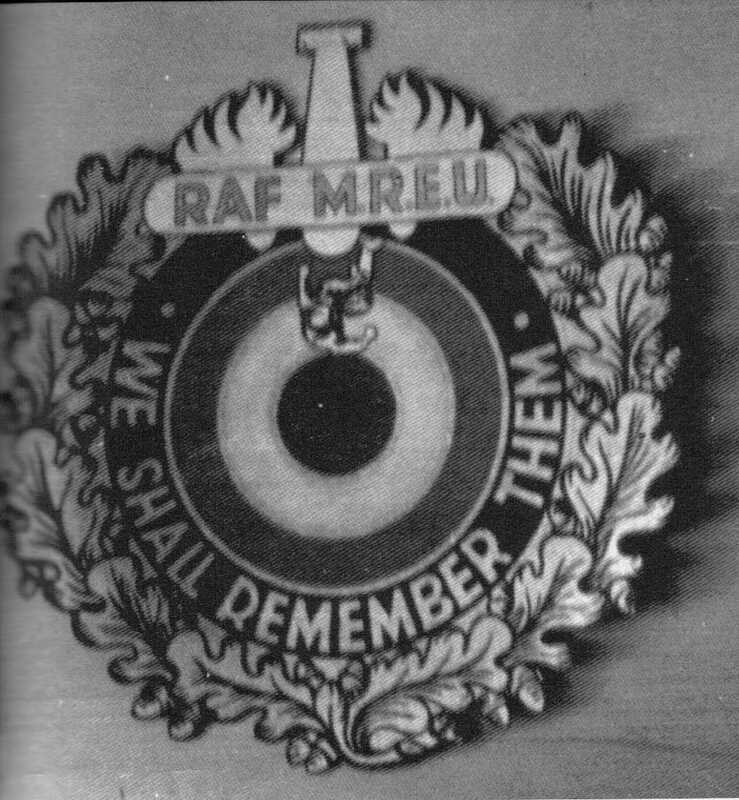 On 7– Feb 1947 RCAF HQ wrote to The Air Member for Personnel, Air Marshall Sir John Slessor DSO MC, to remind him that the majority of the 55 RCAF personnel engaged in M.R.E.S. work in Europe were men who had enlisted only for the duration of the war. The RCAF were working to a deadline. 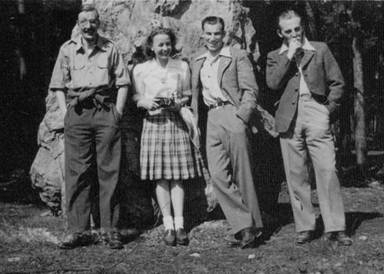 These men had to be released from their duties and repatriated back to Canada by August 1947. 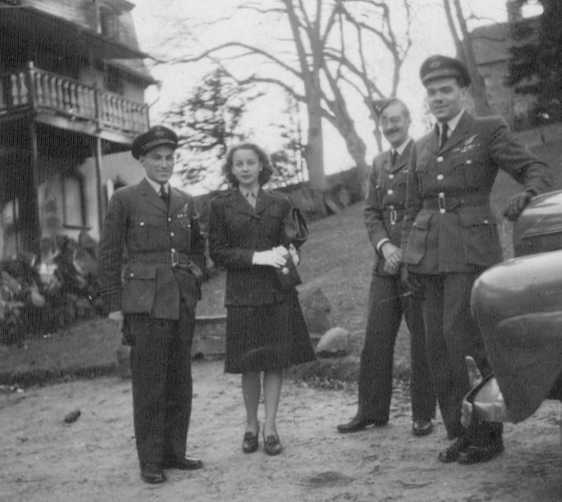 I had already seen the initial wave of RCAF returnees with Canadian airmen Sgt Leduc and LAC Ricard then attached to the Norwegian M.R.E.S. 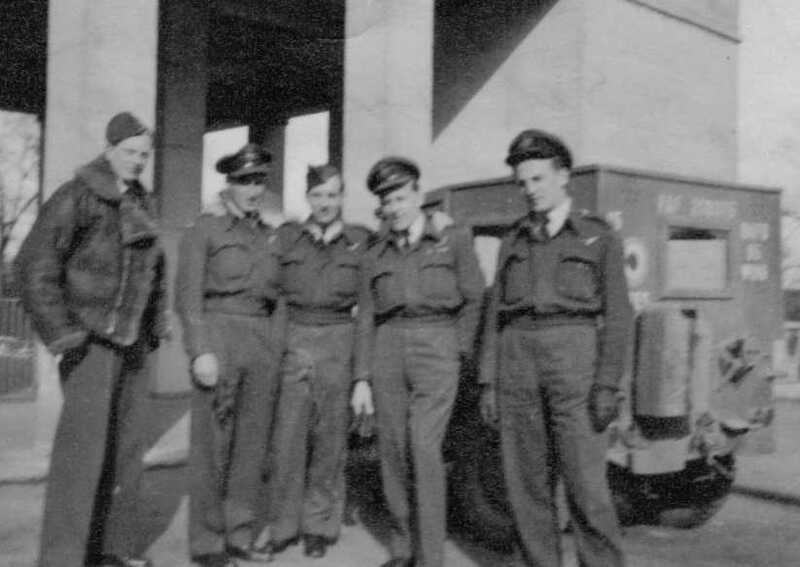 unit repatriated to Canada mid July 1946. Now it was my turn. 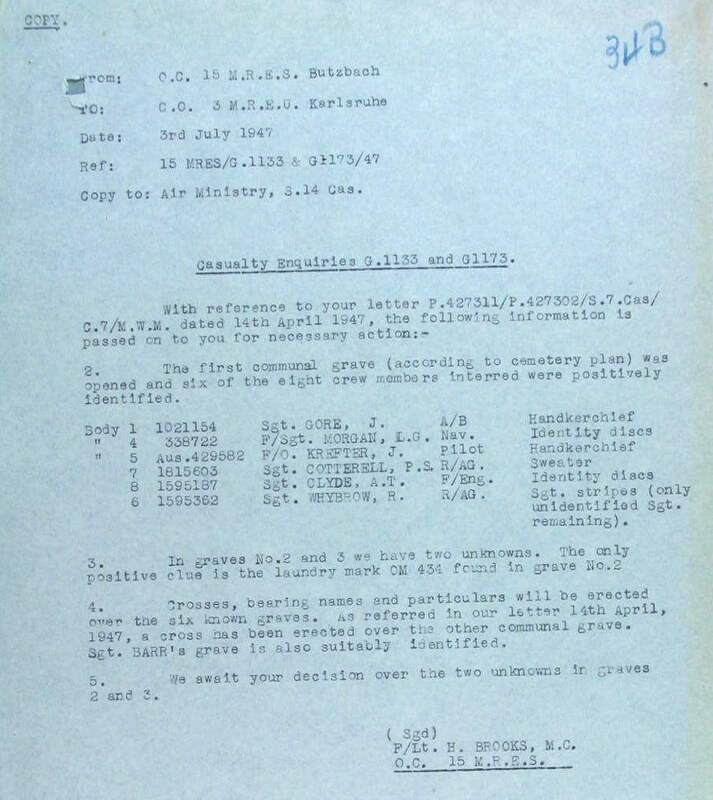 Following up on the RCAF HQ letter I was ordered to prepare for repatriation back to Canada. I reluctantly closed down my activities July of 1947. As it turned out the actual date for closing down all operating in the American Zone was October 1947 so the bulk of the work had been done. 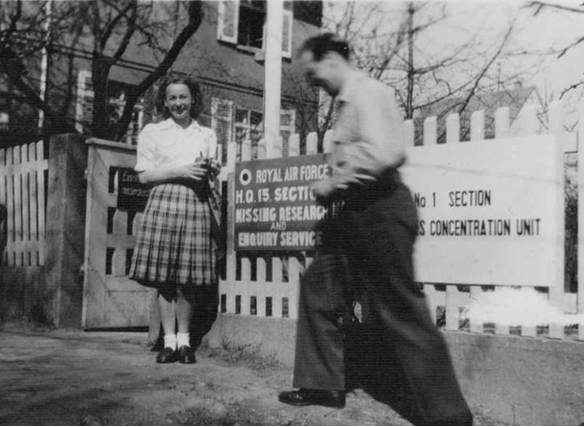 The RCAF did leave one Liaison Officer behind to interface with the M.R.E.S.. So on 31–Aug–47 RCAF F/L Lejeune was so appointed. On weekends I had several visits from my former boss and friend from Operation Polesearch in Norway, S/L Chick Rideal who came down from Munich. Bea of course was already based in Frankfurt with the American Occupation Forces working to reunite dislocated families. 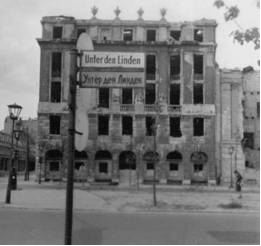 Bea and I made one weekend trip up to Berlin to witness the devastation. These are the only pictures that made it through the various transfers since then. It was just before leaving Europe that I proposed marriage to Birthe Grontved. She accepted. We did not have a date or place for the wedding – these arrangements we would make in the next few months. 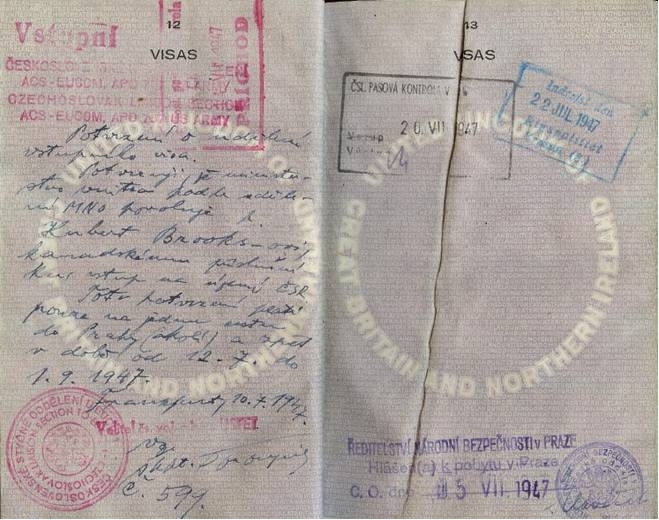 Editors Note: According to passport documents, it seems that Hubert Brooks and his fiancé Birthe Grontved entered Czechoslovakia in July 1947 presumably for a final holiday before Brooks returned home to Canada. The Czech border was within driving distance due east of Frankfurt. 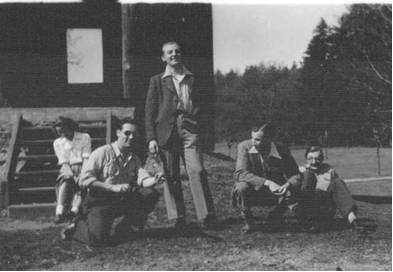 It is not known whether or not Brooks visited fellow Canadian G/C Walter McLean then CO of NO 2 MRES responsible for the French Zone of Germany and Czechoslovakia during his brief holiday in the country.